I’m not a big instagrammer nowadays, as I’ve mostly been spending my days at work or else travelling. Unfortunately, this doesn’t make for interesting pictures. I have managed to accumulate a few beautiful images over the last month so I thought I’d post a little summary blog post on these images to put a more personal spin on my blog. I’ll talk about the images from left to right. The second image is a beautiful image of where my parents live in Lancashire, where there are just miles and miles of countryside and fields. There’s also a beautiful reservoir where you can go sailing. My cousin and I are very close, and she just recently came to visit me in Strasbourg, where until 3 weeks ago I lived. The third picture is of us two as little ones, I think we were around 8 or 9 years old and it’s lovely to see that we’ve always been as close as we are now. I went to Paris with the same cousin whilst she was over in France for the day, and obviously we visited all of the different monuments and were super-tourists whilst we were out there. The fourth image is the fountain at Place de la concorde, the seventh is the back of Notre Dame cathedral, where we visited early doors. We also climbed the Eiffel tower, which for me is remarkable as I’m pathetically afraid of heights, to the extent where I normally cry when I have to go up to high heights. I actually managed to climb up to the second floor of the tower and didn’t get too stressed out about it so woo me. We went to the Louvre (to see the Mona Lisa) and I love the pyramids outside so I took a couple of pictures of different views of those. 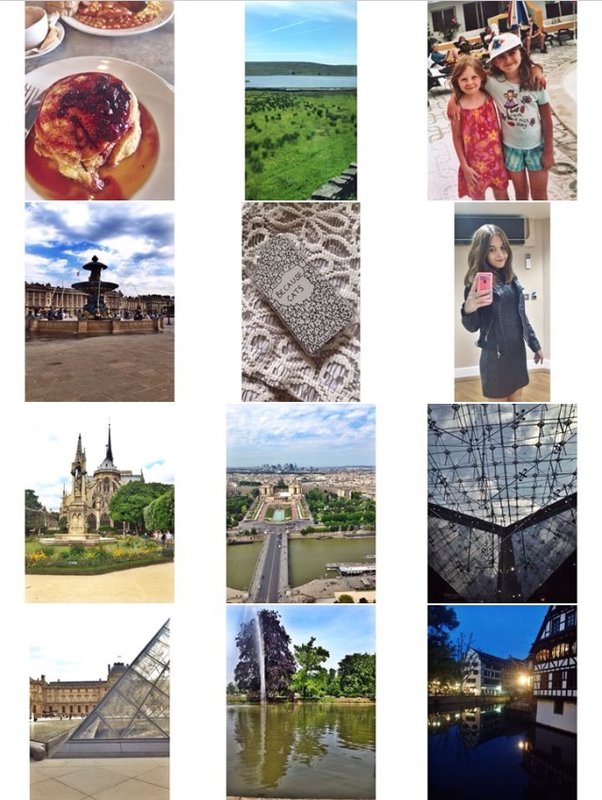 The final two images are of different places that I took my cousin to in Strasbourg. The first of the two is Parc de l’Orangerie, where we went one afternoon to sunbathe- Strasbourg gets to around 35 degrees around this time of year so it’s perfect weather to get a tan. The last is my favourite place in Strasbourg, Petite France, at night. It really is a beautiful place to live and my photos just don’t do it justice. I’d love to hear what you guys post on instagram! Let me know in the comments!